In this lesson 25 you’ll solve the mystery of qui or que. Please note that lesson 25 of Season 2 was originally known as lesson 65 of Coffee Break French. We have renumbered the lessons of each season as lessons 1-40 to make things more simple for our listeners. In this week’s lesson we’re building on the verbal constructions we’ve been learning over the past few weeks and introducing the phrase après avoir fait quelque chose. This lesson also explains what happens when an être verb is used with this construction. Please note that lesson 27 of Season 2 was originally known as lesson 67 of Coffee Break French. In episode 32 of Coffee Break French we’ll hear the next instalment of the conversation between David, Christina and Jean-Jacques. 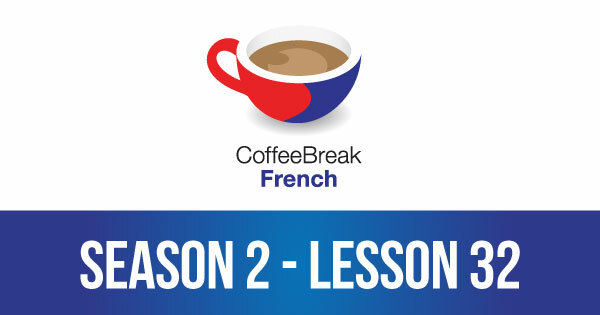 Please note that lesson 32 of Season 2 was originally known as lesson 72 of Coffee Break French. We have renumbered the lessons of each season as lessons 1-40 to make things more simple for our listeners.